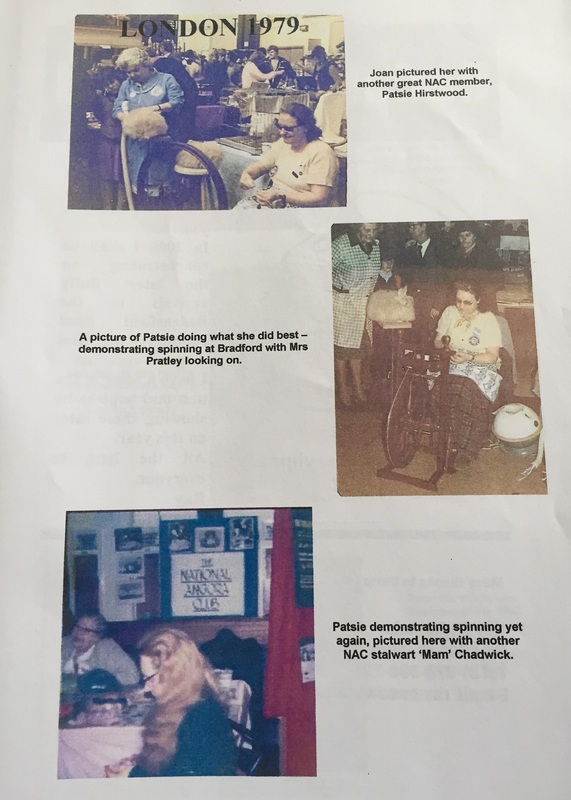 Posted 19/04/2019 by SM & filed under General interest. Posted 15/04/2019 by SM & filed under General interest. Posted 09/04/2019 by SM & filed under General interest. Posted 05/04/2019 by SM & filed under General interest. When our secretary asked for items, articles or even letters for the Year Book at the end of the Annual General Meeting. I wondered whether this may be the place to make a plea to members exhibiting their Angoras for a little more show preparation. 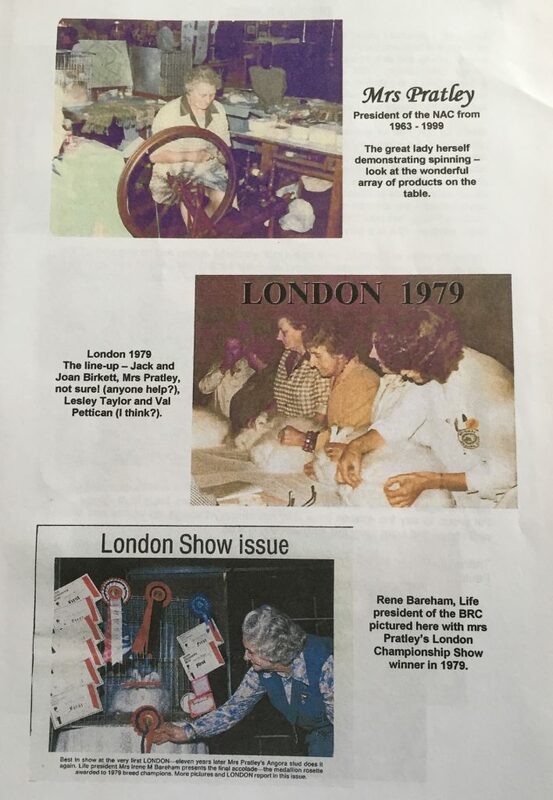 This last year I have handled quite a number of Angoras at shows in different parts of the country, more often than not, have found a lovely exhibit for my best, grand head, good coat and length, good furnishings, type, etc then, picking it up to examine under – alas! Stains, usually in the groin and at timed, also stained feet. In the main, this is applicable to white Angoras and consequently the stains show much more than on coloureds. 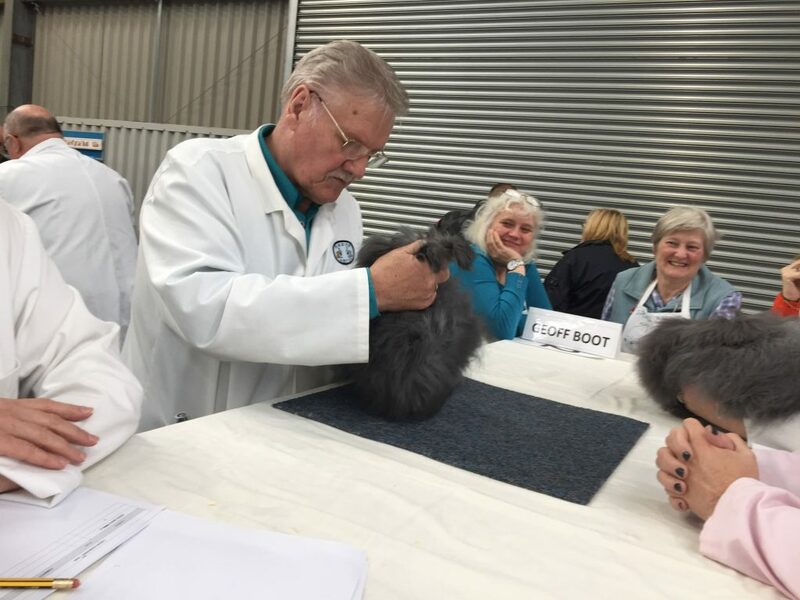 Nothing is more disappointing to a judge when he or she thinks they have discovered a rabbit to make their eyes sparkle – then discover it fails on show preparation. For although it can win Best of Breed with its outstanding quality, it cannot get to the top in duplicate classes along with good specimens of other breeds, when the latter are fit and clean. 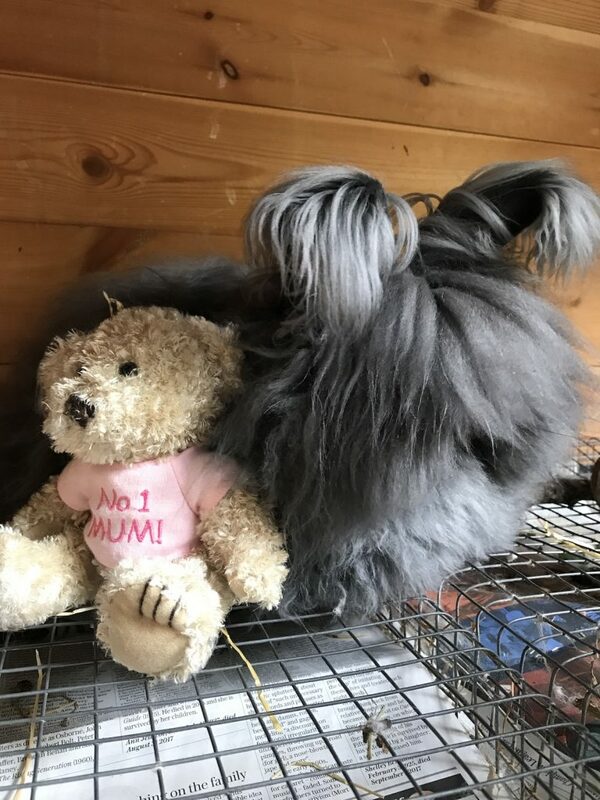 It is no use whatever putting up a rabbit which is stained under (or on the feet) when judging with Fur and Rex judges – they do not stand an earthly chance – and its heartbreaking knowing what OUGHT to be at the top – and it is not, due to condition. 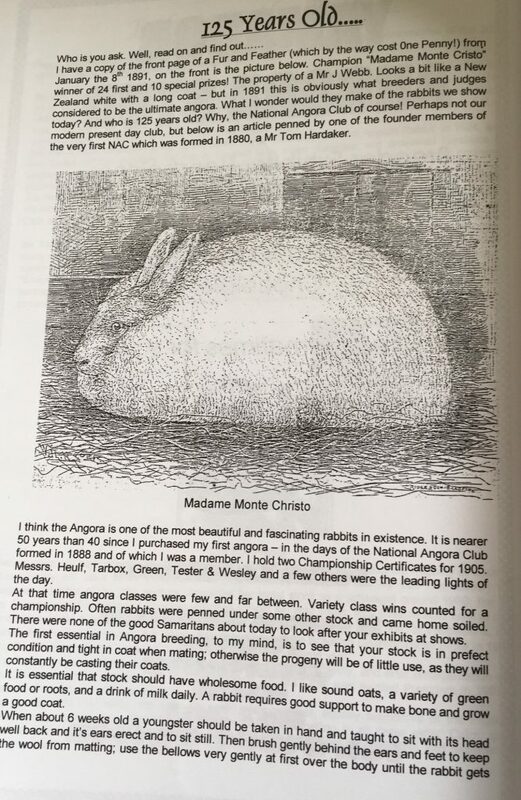 I am only too well aware of the greta problems in keeping white Angoras clean and fit for exhibition, ready to compete with the best Fancy rabbits and my sympathy is with our breeders and exhibitors – you all deserve a medal! A white angora rabbit is the first rabbit I ever recall when I was about 3 or 4 years old (and thats a heck of a long time ago now!!) 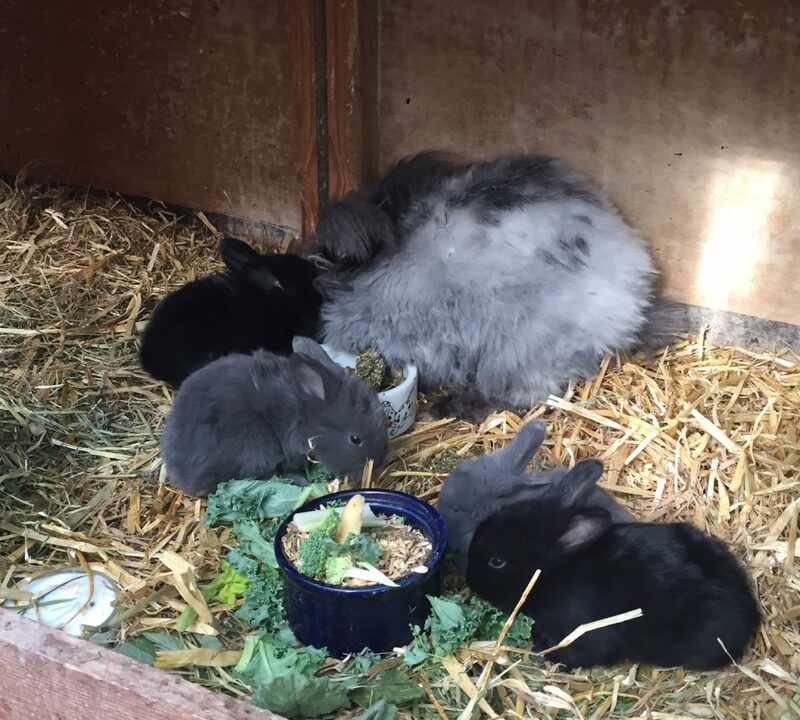 in my fathers rabbitry, along with his other breeds. 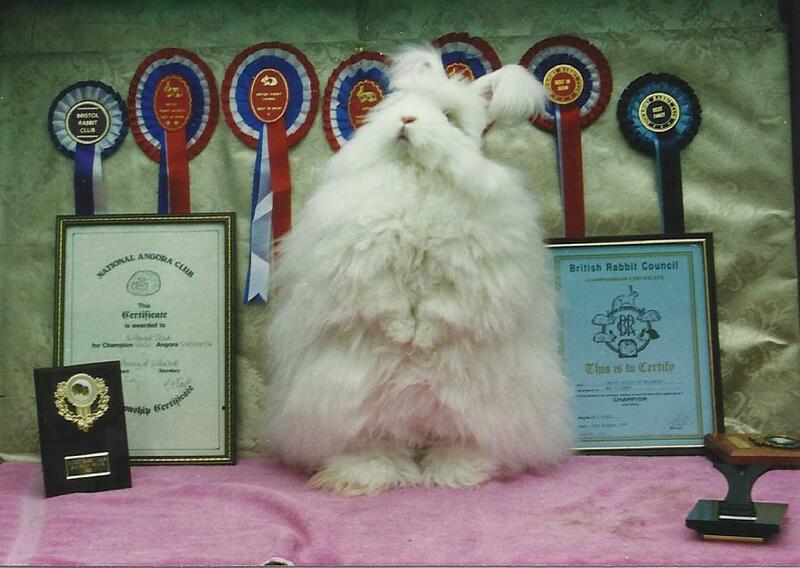 He kept Dutch, English and a few Himalayans and one or two Silvers and just the one Angora. This beautiful rabbit that seemed to fill the hutch caught my eye and I have never forgotten it. My Father liked them and intended to keep a few, but he was farming at the time, working very long hours in those days, seven days a week and did not have the time warranted to devote to the breed – I remember he gave the Angora to a friend of my parents, who absolutely worshipped it! She did not show it, but was everlasting and grooming it (I presume she clipped it, but I didi not know about clipping the them) and she kept it till he died. 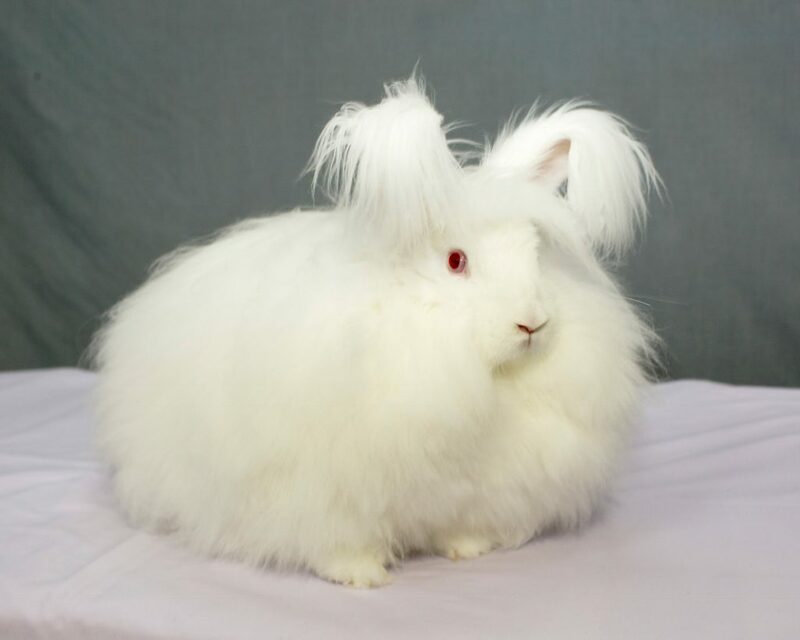 After I started keeping rabbits (first breeding chinchillas) I told my father I could remember this white angora in his hutch and asked why he did not keep it – “too much b….. trouble” came the terse reply and not enough time. “Ah well, I guess we can all appreciate this reaction under the circumstances. There are all sorts of preparation for stain removal, but it is trying to find out which one really works! 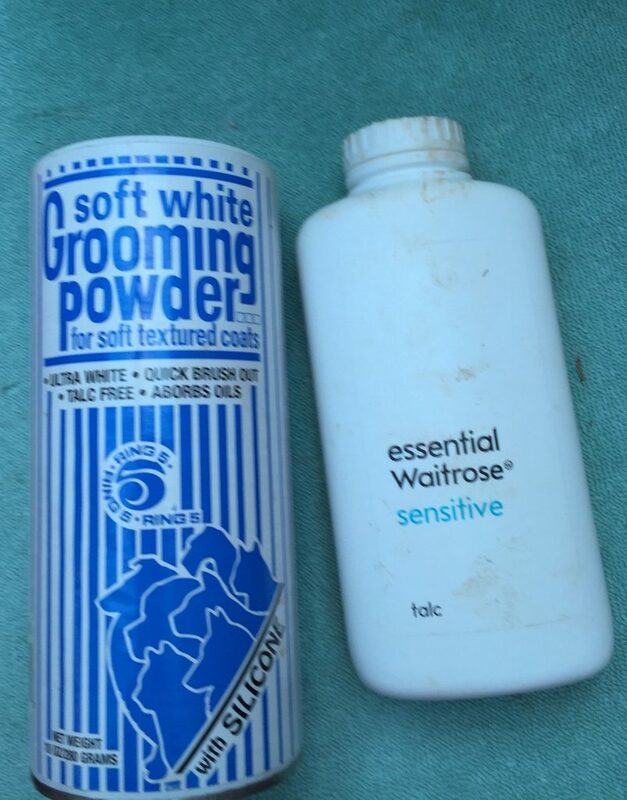 I was told last year of Johnson’s Spirit Shampoo, and there is also a foam shampoo and an old remedy is Peroxide and Talcum powder mixed to a paste and applied a day or two before exhibiting – I have been assured this is quite successful but do not know from experience. However, I gather that my dear young friend Mike Head, with who I have travelled to several shows this year has made a break-through in devising an adaptation to her hutches in an effort to keep her white angoras clean – and it works. 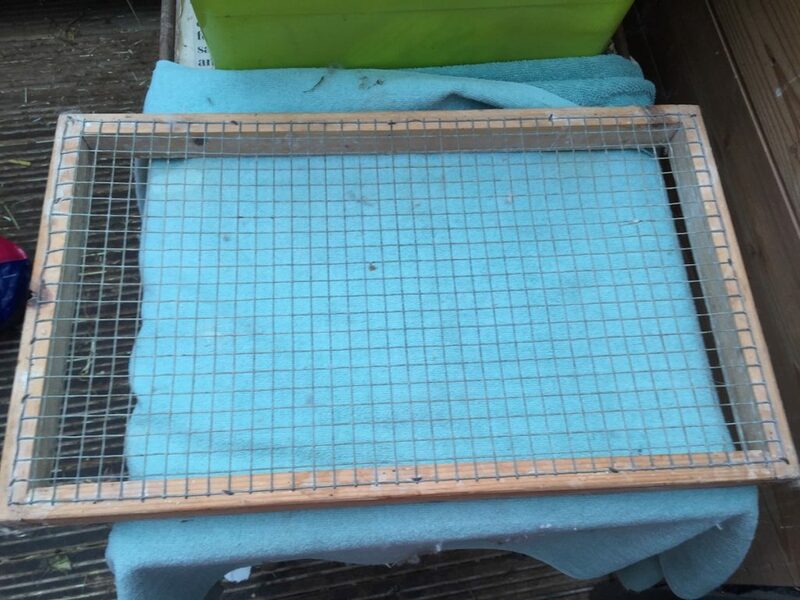 Mike has adapted for a start, six hutches in two stacks of three each hutch at the base having a moveable galvanised tray 11/2” deep ( with newspaper spread over the bottom) and to be pulled out with a knob. On top of each tray is a wooden frame 3/4” going all round the four sides of each hutch. Mike bough 14′ lengths of angled Aluminium (L shaped). 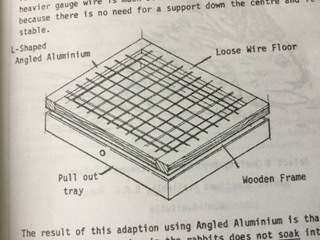 Resting on the wooden frame, she has loose wire floors of galvanised wire mesh, 14 gauge, with a mesh 3/4” x 3/4” (the heavier gauge wire is much better than the usual wire floors supplied, because there is no need for a support down the centre and it is very stable. 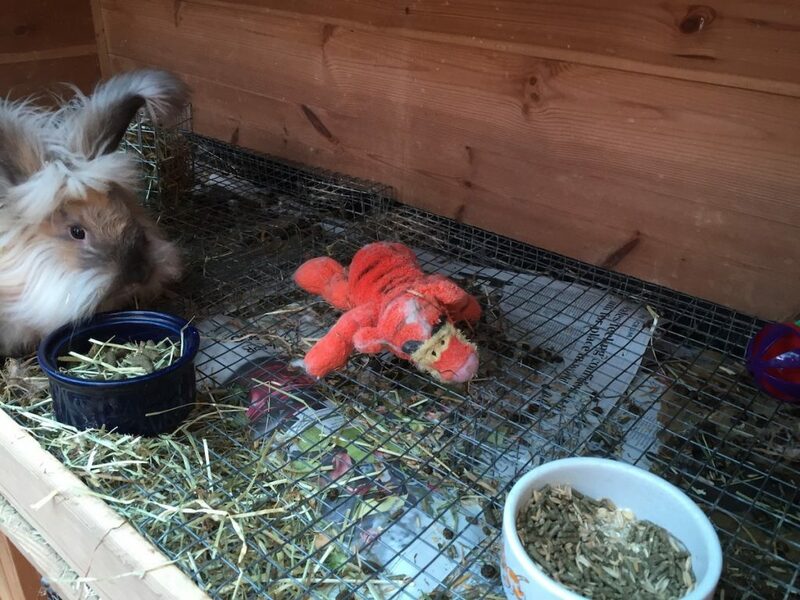 Mike reckons that each hutch has cost approximately for the adaptation and considers it well worth the effort and expense. 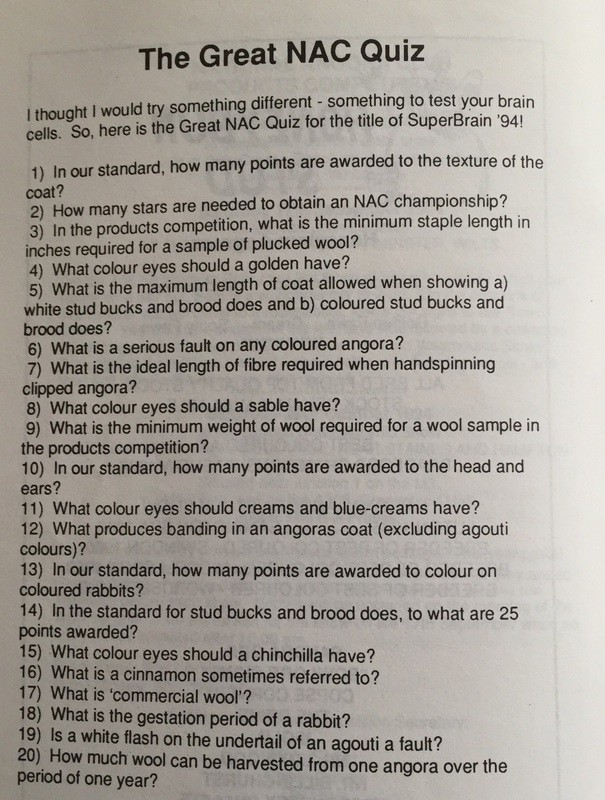 I wish all exhibitors the best of luck with breeding and showing for 1991. 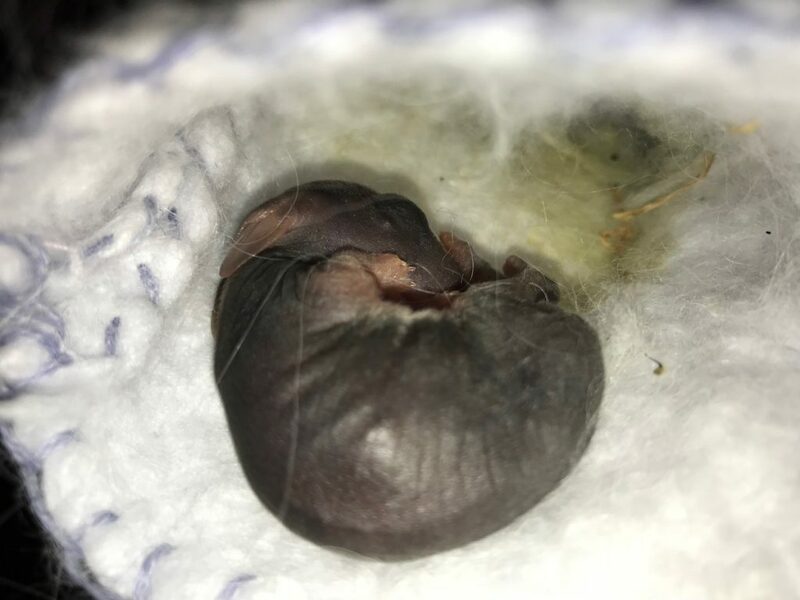 Posted 02/04/2019 by SM & filed under General interest, Showing Angoras. 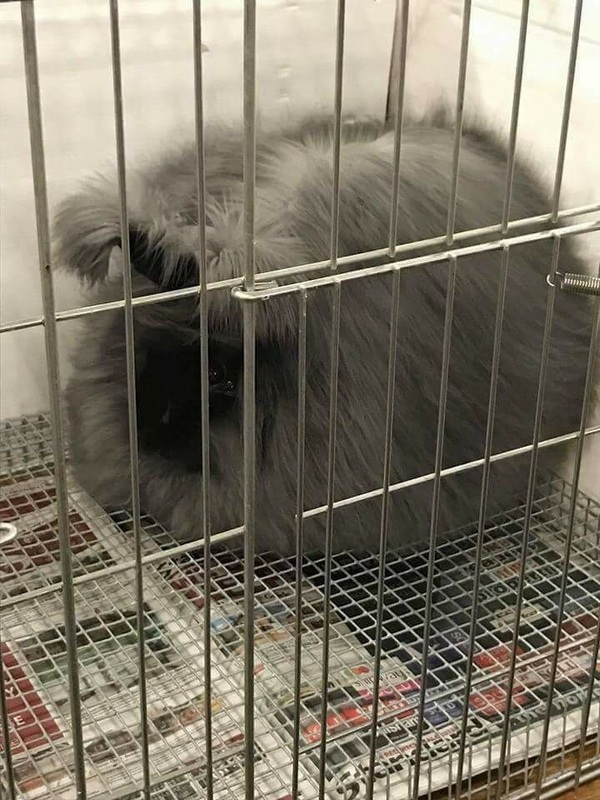 If you own an Angora rabbit, it is important to ensure that it is being kept in a healthy condition at all times. Here are some basics to check. 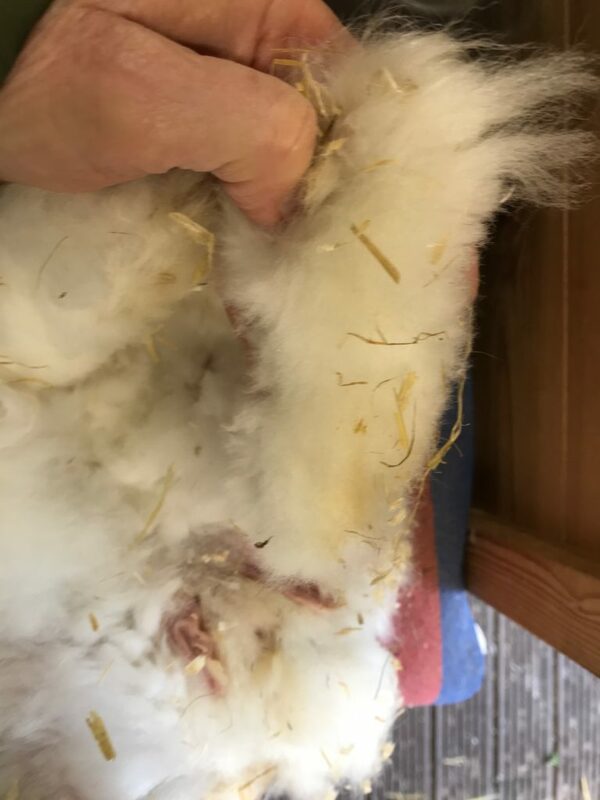 As you pick up your Angora rabbit to examine it, check the weight and examine the body for lumps, abnormalities, wounds, cuts, bald patches, scratches and any damage. Check the overall feel of your angora and ensure that it is well coloured in wool and flesh, they are a fairly small bodied rabbit but look larger due to the wool. Posted 31/03/2019 by SM & filed under General interest. I got the email from Gayle at Countryfile in February 2015. 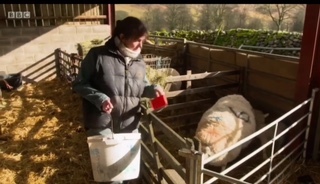 She explained that the programme was looking to do a feature on ‘Farm to Fashion’ to be put out around London fashion week and were interested in talking to me as a British producer of luxury yarn. 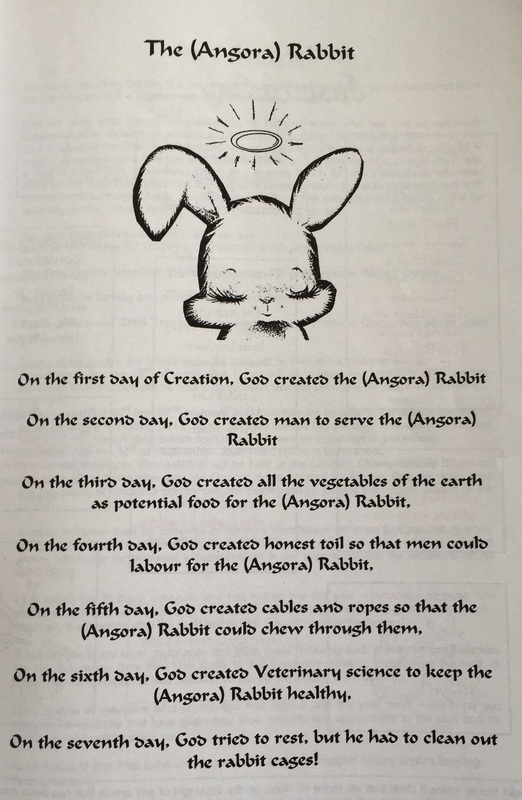 Posted 20/03/2019 by SM & filed under Angora Welfare, General interest, Wool Products. Posted 17/03/2019 by SM & filed under General interest. Posted 14/03/2019 by SM & filed under Angora Welfare. Posted 07/03/2019 by SM & filed under Showing Angoras.